Oh it's that glorious time of year again, we're eating turkey dinners and making turkey stew, leftover turkey sandwiches and pumpkin pie. We're getting ready to hang out with family and friends that we haven't seen in a year and we're getting super excited for the day the big guy comes. We have a fantastic Santa Sack for the big day. It's back by popular demand and awaiting your customization. If you're interested in ordering one of these please place your order soon. We're only getting one shipment this year so once they're gone, they are gone. 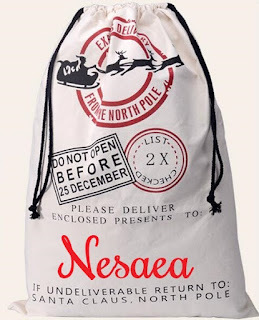 Follow THIS LINK to order your sack today. We currently have a 14 day turn around. This doesn't mean your order will definitely take 14 days but with all of the sign orders, t-shirt orders and other orders coming in we want to ensure that we don't fall behind. If you want to place another order or stop by a craft sale that we'll be attending this season please check out the where to buy section of our website for information on where we're going to be. Have a great day everyone, I better get back to work. Enjoy the rest of your week.